stock specialists will be trying to hold it up here as they "trade out their paper"
10/23/2009 12:47:26 PM MT TG****:: Further, it did pretty much work today spot on with a correction just over 1 hour 20 minutes. Could have, should have, would have been nice to have sold the first down 3 minute candle out of that correction. 10/23/2009 12:42:58 PM MT TG****:: JAB, found the quote from 6/5/09 clinic. "The range is 24 points-very high for this time of day. Gann's squaring of price and time says it takes a time period equal to the range for the move to be digested. Of course there is a scale factor involved. For intraday S&P trading the scale is usually 3:1, so a 24 point move may have an 8 hour congestion. Another common scaling is 15:1, so 24/15= 1.6 hours - either way, we have time to wait." My own thoughts are that it can be a little subjective as to what constitutes a continuous move. Today's initial drop seemed like one major move having never really corrected back to the 110 exma on a closing 3 minute bar basis. 10/23/2009 11:33:38 AM MT jab****:: Oops, meant 15...thanks again. 10/23/2009 11:27:13 AM MT TG****:: No, in this case, 19.5 pts divided by 15 gives 1.3 hrs. I usually don't divide by 3 but 15, though Al has mentioned 3 works too but that would mean a lot of hours of correction for each sizable move. 10/23/2009 11:13:21 AM MT jab****:: Thanks, TG: you divided by 3: got it. 10/23/2009 11:06:35 AM MT TG****:: No, but sizable moves usually need to be digested. I think in past clinics Al mentioned it as a concept that goes back to at least Gann. Two scaling factors that typically work to turn the size of the move to hours was to divide by 15 or 3. 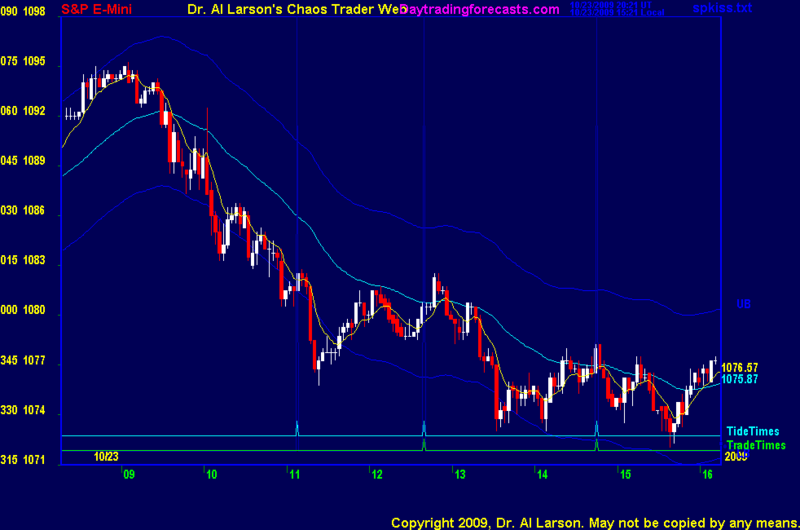 10/23/2009 10:35:17 AM MT jab****:: TG: re your question about time, were you figuring a 50% time retracement? 10/23/2009 10:29:37 AM MT mm****:: Al - does one know what percentage of trades is still "controlled" by the Specialists ? 10/23/2009 10:12:55 AM MT TG****:: Al would you pretty much call that one uninterupted move of 19.5 pts, thus should see about 1 hr 18 min of correction?